Tulku Damcho Rinpoche was born in Nupri, a remote area of northern Nepal. At the time that Thrangu Tashi Choling Monastery was being established in Bodhanath, Nepal, in the mid 1980s, he decided that he wished to be a monk at that monastery. Even though he was very small at the time and was refused admission, he would not leave until Thrangu Rinpoche agreed to accept him. Thrangu Rinpoche found that even as a young monk, in his behavior and his studies he was unlike the others. He had special characteristics as a dharma practitioner, scholar, and teacher. On a visit to Nepal, His Eminence Tai Situ Rinpoche recognized him as a reincarnation of Lama Tsoknyi, a monk at the monastery of Thrangu Tashi Choling in Tibet. Lama Tsoknyi was an important teacher in the Kagyu tradition, who was noted for having performed two thousand nyungnes (the practice of the ritual of the Thousand-Armed Chenrezig) with great austerity, giving rise to extraordinary experience and realization. Some time after this recognition, Tulku Damcho was enthroned as a tulku. Tulku Damcho studied with distinction in monastic college, and he completed the traditional three-year retreat and an additional year of Kalachakra retreat in 2007. Tulku Damcho speaks English well. He has taught at Thrangu Rinpoche’s centers throughout North America and Europe. Lama Pema Tsewang was born in 1972 in Tsum, in the Himalayan border region of Nepal, into a family of great Buddhist practitioners. 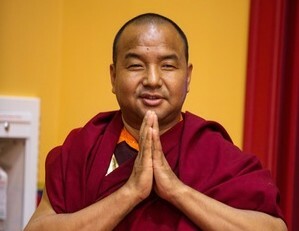 He is the eldest son of Lama Pema Lapchen Rinpoche, who traces his family lineage to that of the Ngak Labrang of the great thirteenth-century Nyingma master Guru Chowang, who was one of the five great tertons (revealers of hidden teachings buried by Guru Rinpoche for the benefit of future beings). In 1981, at the age of nine, Lama Pema entered Thrangu Tashi Choling Monastery in Boudhanath, Kathmandu. In 1983, he took the novice vows of a monk, formally departing from the family tradition of lay practice, and in 1989, he took the full ordination vows of a gelong. He entered the first three-year retreat that was held at Namo Buddha Retreat Center in Namo Buddha, Nepal, under the guidance of Ven. Thrangu Rinpoche. After retreat, Lama Pema as per tradition returned to Tsum and received all the empowerments for his family lineage of Guru Chowang. After completing his studies in Buddhist philosophy and ritual in 1997, he became the principal of Shri Mangal Dvip School, Rinpoche’s school for Himalayan children in Kathmandu, Nepal. Lama Pema was then appointed as the discipline master for Thrangu Tashi Choling Monastery in 1999. In 2002, Rinpoche appointed him as a Vajra Master, one of the highest posts in the monastery. 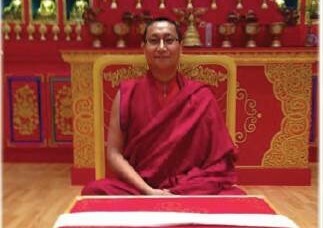 Lama Pema is now the head resident lama of Thrangu Monastery Canada, the chief representative of Ven. Thrangu Rinpoche in North America. He travels to teach Rinpoche’s students throughout North America. Khenpo Jigme was born in the Kingdom of Bhutan in the town of Barshong in 1968. In 1980 he became the first Bhutanese monk of Thrangu Tashi Choling Monastery in Kanglung, Bhutan. In 1983 he came to Thrangu Tashi Choling, Thrangu Rinpoche’s main monastery in Boudhanath, Nepal, and received full gelong ordination from Thrangu Rinpoche. He entered Namo Buddha Institute for Higher Buddhist Studies at Namo Buddha, Nepal, in 1989 and completed the five-year program. In 1994 he entered the traditional three-year retreat at the retreat center at Namo Buddha. As Khenpo Jigme was skilled in Buddhist philosophy, ritual, and meditation, in 1997 Thrangu Rinpoche appointed him as one of the main teachers at the Vajra Vidya Institute in Sarnath, India, and gave him the title of khenpo. This title is given as a master of Buddhist philosophy, similar to a PhD. in Theology. He has also taught Buddhist Dharma in Malaysia. In the spring of 2005 he began teaching the Dharma to Western students, and since 2006 he has resided at Vajra Vidya Retreat Center in Crestone, CO, instructing the retreatants there and traveling to teach at Thrangu Rinpoche’s centers throughout North America. Khenpo Lobzang Tendzin was born in Bhutan to Tibetan parents in 1969. At age nine, he asked his family if he could be a monk, entering a small monastery that had been offered by the king of Bhutan to His Holiness the Sixteenth Karmapa, who in turn offered it to Thrangu Rinpoche. 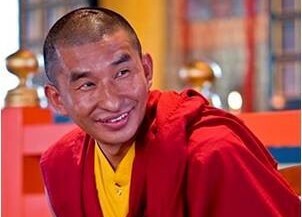 At thirteen, he moved Thrangu Rinpoche’s main monastery in Boudhanath, Nepal, and began his studies with Khenpo Ngedon, learning pujas and studying commentaries. After completing the five-year course of study at monastic college, he became an assistant teacher, then a full-fledged teacher, and in 1996 was appointed khenpo. For more than ten years Khenpo Lobzang served as the director of Vajra Vidya Institute in Sarnath, India. In addition to his many administrative responsibilities, he taught shedra classes for the monks and seminars for foreign students and was a guest lecturer at Central University of Higher Tibetan Studies in Sarnath. He also studied English at Oxford in 2009. 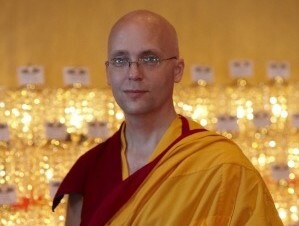 Since 2013, he has resided at Vajra Vidya Retreat Center in Crestone, CO, and travels to teach Thrangu Rinpoche’s students throughout the U.S.
Khenpo Karma Choephel is an American monk who is a senior student of Khenchen Thrangu Rinpoche and a graduate of Vajra Vidya Institute, Rinpoche’s monastic college in Sarnath, India. The author of numerous published translations, he is Thrangu Rinpoche’s principal English translator and has also served as a translator for His Holiness the Seventeenth Karmapa.